Going-ons in the library this chilly spring! Special Events! On Monday, February 26, 2018 at 7:00 pm the library will be hosting Duchess Harris, PhD for a discussion on the Black Women of NASA in the Mother Hill Reading Room. 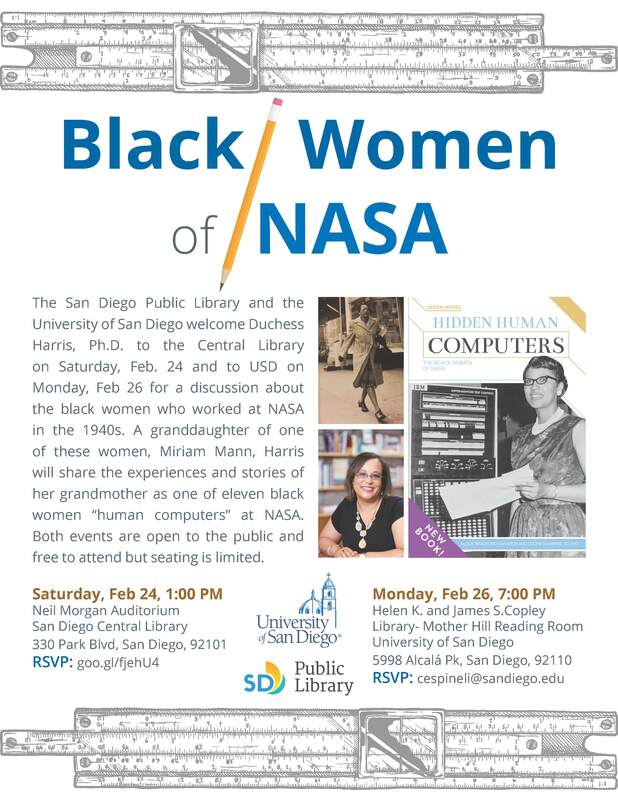 Join us to learn more about the black women who worked at NASA in the 1940s as human computers. The event is free to attend but seating limited. To RSVP email cespineli@sandiego.edu. To learn more about the time period and these women’s amazing feats, check out this research guide created by our University Archivist, Diane Maher here. Workshops! Our workshop series for the semester got underway last week. The workshops’ topics range from learning about the library’s many research tools to specific citation styles such as APA, Chicago, and MLA. 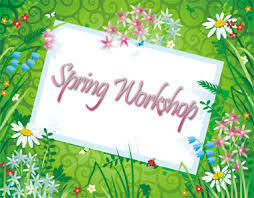 To find out more about the library workshops and sign up for one click here. Open Education Week! 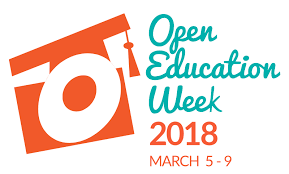 Through the week of March 5, Copley Library is supporting Open Education Week by hosting events and a contest. On Monday March 5 at 12pm, Copley Library will have a table in front of the library asking students to answer two questions regarding their current textbook expenses and take a selfie with their answer. On Tuesday, March 6 Amanda Makula, Digital Initiatives Librarian, will be teaching a faculty workshop on open access. Through the week of March 5, USD faculty and students will be invited to participate in a contest at the Access Services Desk. You can learn more about Open Education Week here. And remember we’re still open until 2 am Sunday through Thursday for you studying and research activities! For special hours check out the library’s schedule here. The weather should be warming up soon, we promise! USD Ethnic Studies Prof. Alberto Pulido and Rigoberto Reyes, Director of Community Engagement at Via International and founding member and former president of Amigos Car Club, have collaborated over the years to document San Diego’s lowrider car culture, ultimately publishing their research in San Diego Lowriders: A History of Cars and Cruising and producing and directing the award-winning documentary Everything Comes From the Streets. A movement born in East-LA and most popular in the 1960s and 1970s, lowriders were highly customized cars with intricate paint-jobs and specialized hydraulics, with no details overlooked. The cars won awards and certainly stopped traffic. Car clubs were important gathering places for the San Diego neighborhoods of Logan Heights, Sherman Heights, National City, Old Town and San Ysidro, and a vital display of Chicano pride. San Diego was home to 28 lowrider car clubs that were active from 1950 to 1985. The San Diego Lowrider Archival Project, a collaborative, interdisciplinary endeavor between the University of San Diego and the local San Diego lowrider community, aims to recover and document the history of lowriding in San Diego and the surrounding borderlands by preserving and showcasing photographs, car club documents, memorabilia, dance posters, lowrider art, and more. These materials reflect important qualities of the lowrider movement: creativity, independence, cultural pride, resistance, activism, community service, collectivism, tradition and ritual, and cultural continuity. Visit the collection here.